Oh charts. Charts are really great at showing you an established pattern, and are a reasonable way to forecast future events if it can be expected that the pattern displayed by the chart proves to be true. It is faith in these patterns, based on patterns, based on other patterns, which probably originate by some accountant's cooked books which might explain the widely expansive forecasts of the modern day. The pattern continues until it doesn't, a circumstance or condition changes and all previous models based on established patterns begin to fail such as world growth models are now. Just recently I have been having a lot of conversations on Twitter about U.S. hyperinflation, or rather the likely-hood of that happening. I personally see hyperinflation as inevitable in the U.S. however the 'why' and 'how' are not going to be what people expect. The U.S. economy is unlike any economy prior to it, it's importance in the current economic ecosystem is unparalleled to anything we have ever witnessed in human history. The closest thing might be Rome, but even then our reliance on the modern economy and industrial supply chain to take care of our most basic needs such as food makes even that comparison moot. It's easy to lose sight of where the real productive economy ends and the monstrosity we call "financial services" begins. This is not to say that as a society we don't need "financial services" - we do - but the moment we forget that these entities unto themselves do not produce anything tangible at all and start, say, using their GDP figures which dwarf the figures from any other industry as evidence of "recovery" we risk getting lost in the patterns and charts instead of simply looking around at what's going on. You'll know you're reading someone who is lost in the patterns when what you're reading about the economy oddly resembles the weather. In particular, when it comes to human responsibility in regards to the economy, we act as though banking collapses and such are hurricanes or tornados; unavoidable catastrophic events which always inevitably signal a new round of austerity or "belt tightening" for the productive segments of the populace. "We didn't see it coming". This is despite the fact that the economy is a human invention, can be modified at any time at our will, and perhaps more importantly is simply supposed to facilitate the supply and demand of goods and services. The economy responds to human activities, and is supposed to be in service to those very humans. Today a few hours after my conversation on hyperinflation, someone replied: "Trillions will never 'come home to roost' it's suicide for any holder of US bonds & the Fed knows it. The Fed would walk away from every bond written.". Unfortunately the conclusions I've made from my research lead me to believe that we are past the point where the Fed's actions even matter. Let me try to visualize for you where we are in the current scheme. Picture the economy is a boat heading towards a giant water fall (for entertainment value we'll call it the fiscal cliff), the Fed is basically the guy driving our good ship Economica and pretty well only has two options of what he can do: Full speed ahead, or full stop. Full stop isn't actually full stop as the momentum already built up is more than enough to push the boat over the edge, and making matters worse the closer to the edge you get the faster and rougher the waters become making it more and more difficult to address the situation in any form. Doing everything and doing nothing will both result in the same thing, the 'what' is already known and we're heading towards it however the 'when' is dependant on how much effort is put into trying to push it off into the future. Sooner or later though, you're going over that edge. The Federal Reserve has complete control over the throttle of the engine room, they do not however have any control over the direction of the boat. U.S. hyperinflation can not, by nature of the U.S. and global economies, simply occur due to currency devaluation. Currency devaluation on it's own isn't enough, at the end of the day you have to look at what families buy, and what might affect those commodities to increase in price. What's key to understanding where this hyperinflation will actually come from is the understanding that externalization of cost has been happening for a long time, this phenomenon has been building, compounding the effects back onto itself and the further we push it off into the future the worse it's going to be, not just for the U.S. but for pretty well every country in the world dependant on the U.S. currency. For the purposes of this post we're going to use Canada as the role of the 'supplier' (since I know it well and in comparison to countris like China is a lot less involved in the manipulation of currencies), and with the U.S. as the 'consumer' to better illustrate the cause and effect relationships between the U.S. and it's suppliers. In reality China will likely be the primary source of hyperinflation for the U.S. however Canada provides a better example and will have an effect albeit to a lesser extent, especially considering how close China and Canada are getting. The relationship between the CAD and USD leading up to the crisis and ever since has been something quite new in Canadian history and for Canada it has been quite a challenge to adjust business models which were based upon a roughly 4:5 ratio ($0.80 CAD per $1.00 USD). The reason why provides the context for the global currency war: with a 4:5 ratio the Canadian and U.S. relationship was balanced, we were selling and more importantly they were buying because it was affordable. 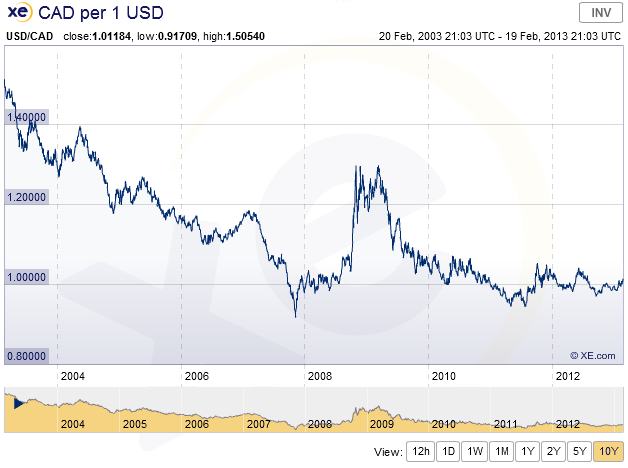 However, with the exception of the blip in valuation in 2009 which could easily be explained by global mass confusion (or a new president, whatever, a lot of significant events happened in 2009) as well as anything else as we have remained more or less at parity with the USD with fairly minor deviations ever since. This parity with the U.S. is part of the reason Canadian exports are depressed and also partially why things are more expensive in the U.S. coming from Canada. Canada is more expensive to import from now which has been the real motivation behind keeping low interest rates in Canada. Our need for low interest rates does not stem from a need for more lending but rather a need to at least keep up with U.S. currency devaluation and we're not the only ones either. Canada as an economy is too small to push any real weight with currency printing, so the best we've been able to come up with is to "hold the line" so to speak on currency valuation. Attempt to keep within the range of par with the U.S. so that trade between our two countries does not become so unbalanced that it becomes unstable. There is a symbiosis there, Canada needs the U.S. and the U.S. needs Canada and what's more, we both need our economies to be balanced with one another. If Canada were to raise interest rates now you would begin to see a spread between the valuation of the CAD and the USD and the U.S. would no longer be able to afford imports from Canada as readily as they do now. The CADUSD currently represents a possible floodgate of sudden cost for the U.S. while serving as a time bomb for Canada's own economy. Canada can't keep up this balancing act forever, low interest rates are having serious effects on the Canadian economy and creating several mega-bubbles of our own, such as housing. With depressed exports, expensive energy, and a number 1 trading partner with credit issues Canada's future situation looks bleak even though it is favourable in comparison to those countries who are the subject of this post, however for more on Canada's situation please look at the rest of this blog. That's all dandy, but what's this have to do with hyperinflation? Glad you asked. The economic symbiosis between the U.S. and Canada exists to an even greater extent between the U.S. and China (not just China though, "emerging markets", but for the purposes of this post we'll focus on China as they are by far the most integral). This relationship is not as easy to understand nor as clear cut as the cause and effect between Canada and the U.S. however it's operating on similar principals. The currency "war" really is less of a "war" than it is a series of predictable reactions. Assuming every country is autonomous in regards to it's own needs, and the needs of the country outweigh the needs of the world then it can be assumed that every country will act in it's own best interest (say as Canada is with it's own interest rates). The currency war is not proactive, it's reactive, the result of central banks essentially trying to compensate for ever growing imbalances in global trade and valuations. This is the momentum in the river we're sailing on; it's like every country has a gun pointed at each others head and now that all the guns are out no one can figure out how to make a move which would lead to putting them away rather than firing one off and having a chain reaction kill everything. As the tweeter earlier said "it's suicide for any holder of US bonds & the Fed knows it", they might know it but they are not the Gods at the table anymore. Their actions now will simply be reactions to the reactions forced by previous actions. Get it? The Fed has got the biggest gun at the table (or at least, they did), so it's unlikely they will be lowering theirs first. The pressures between the currencies can not continue indefinitely, there will be a breaking point when one country or another feels confident and positioned enough to reverse course. Right now any reversing of course between the U.S. and China would be a mutual suicide for both countries, but that doesn't mean they don't want to and sooner or later will have to as the two countries are heading for a straight on collision when it comes to energy. Posted above are 4 articles, 2 about China and it's global position, and two about the U.S. and it's energy economic issues. Just recently the U.S. regulator had to finally grant access for the sale of Nexen to CNOOC and if you look at this situation from the right angle you can see that China is already beginning to use the cards they hold against the U.S. in beneficial ways which for the moment keep the U.S. in working order but for China creates long term assets while for the U.S. takes away those assets. China has been moving into the Gulf, into Canada, into Iraq, they're securing energy assets all over the world. China is carefully positioning itself for the day the symbiosis between the U.S. and Chinese economies collapses and due to the U.S.'s economic position and reliance on China as a supplier there is really nothing that can be done outside of trying to delay the process. On the world stage, especially in dealings with China, the U.S.'s once definitive voice is beginning to sound hollow. There is one, and only one, reason currently why the Federal Reserve money printing does not translate directly to hyperinflationary devaluation and that is that globally oil is traded in USD which keeps the rules related to world trade in favour to the U.S. and also keeps the concentration of currency diluted across the globe. Historically, examples of hyperinflation have occurred in relatively isolated environments and not within currencies held as reserves around the world. Monopoly money only has value within the context and rules of the game 'Monopoly', it does not represent any sort of real value or productive capacity just as fiat currency does not. A simple way at looking at U.S. hyperinflation is that the USD is Monopoly money, valueless out of the context of the rules of the game but invincible and impervious - almost God-like - within those rules. A phrase I used which a few Tweeters have latched on to or have been questioning is that "the trillions worldwide will come home to roost". What this means is that because the USD is the U.S.'s primary export, which they can essentially produce at will and directly buy goods for (currently) with little or no productive input costs, there is plenty more currency in circulation around the world than there is solely in the U.S. economy alone. This currency circles the globe because it is valuable, and it's valuable because no matter who or where you are you need it (or at least can use it) to buy oil. Should the world move away from the USD as the primary currency to buy oil this effectively changes the rule of the game being played. One day in the future the U.S. may have to exchange USD for another currency to buy energy and without some sort of productive economic capacity the exchange rate won't be favouring the U.S.. Right now the U.S. has a trade deficit and the Federal Reserve has to print and monetize debt to stop the government from shutting down; just imagine what this trade deficit might look like with the added cost of acquiring the currency needed for trade itself. Right now the Federal Reserve is inflating the currency for the purpose of effectively paying off debts at a cheaper rate than when it is issued and of course based on these metrics alone the U.S. can never enter hyperinflation, it needs another trigger. This trigger comes when the U.S. has to start actually paying the input costs for their output instead of just recording it as a deficit and forgetting about it while getting their imports anyway. Energy and GDP are closely tied together, an increase in real productive GDP also should equal an increase in energy consumption. What happens to the U.S. trade deficit when simply printing more USD isn't enough? What happens when other countries start asking for something tangible in return? What happens when the motivation to hold the U.S. currency is gone? The Fed already has to print exponentially just to make a somewhat logical case the U.S. doesn't have a debt problem and that is with countries accepting the USD straight-across for commodities. If a loss of confidence does occur the USD being held all around the world, being traded for commodities, will become valuable in only one place almost over-night: the U.S., and the USD worldwide will be returned to the U.S. in short order as a result. In some ways this is already happening, for instance: China is grabbing incredible amounts of energy assets all around the world and they're using their stores of USD to do it and in the process they are exchanging the USD for tangible assets (Many of these assets being bought directly out of the U.S.'s hands). The latest talk in Canada has been of a need to expand our markets beyond the U.S. which for readers of my blog is nothing new, but for Americans this is an indicator of events to come. The inflationary price increases are already here, they're already waiting to flood the market, it is purely due to the U.S.'s unique and important position within the global economy which has kept this at bay but time and tools are running out and pressures are building. The countries that the U.S. depends on for supplies are working to position themselves to withstand the inevitable collapse of the U.S. economy and once they feel suitably positioned there will be nothing for them to hold on to in regards to continuing to use the USD as a reserve. In other words, the rules and context of the game will change and the USD will become just another currency (or people may just start literally exchanging it for energy by burning it to keep warm, who knows). The global position of the USD is a product of the revolutionary industrial superpower we call the U.S., the U.S. that at one time was the world's largest energy exporter and has now turned into the world's largest energy importer. A U.S. whose final card was military might to enforce trade for oil in USD which is now over-extended and falling behind. Coincidentally after writing this post I watched this, very relevant. Thank you for sharing valuable information. Nice post. I enjoyed reading this post. The whole blog is very nice found some good stuff and good information here Thanks..Also visit my page Contractor Accounting Intouch Accountants aims to provide an affordable, timely, clear and concise accounting service for small and medium businesses.